Our area covers Attenborough, Beeston, Bramcote, Chilwell, Stapleford, and Toton; all to the south-west of Nottingham in the southern portion of the Broxtowe Borough Council area, where each of the participating societies are active. This a truly collaborative venture driven by a small working group led by the Beeston and District Civic Society. It includes representatives from the Beeston and District Local History Society, the Stapleford and District Local History Society, and the Bramcote Conservation Society. The working group will wind up once the plaques are complete and explanatory material has been published. 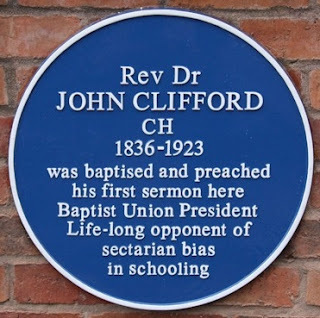 Thomas Barton, our first plaque, was unveiled in Chilwell by Sir Neil Cossons in August 2010. The plaques themselves are locally produced in enamelled cast aluminium by Leander Architectural in Dove Holes, Derbyshire, and, when fixed, become the responsibility of the property owner. Diameter varies between 14” and 18”, prepared to designs based on English Heritage guidance. The cost of supply, delivery and fixing is approximately £300 a plaque, intended to cover material costs only. Research, design, ordering, fixing and, frequently, unveilings are organised voluntarily as part of a single service. Whenever possible each plaque is self-financing, supported by donations from owners and other interested parties, so that costs to the participating societies are minimised. Thus there should be no capital or maintenance costs arising out of the scheme to this Society. Additional funding will be sought for explanatory material. This entry was posted in Annual Reports by Beeston Civic Society. Bookmark the permalink.